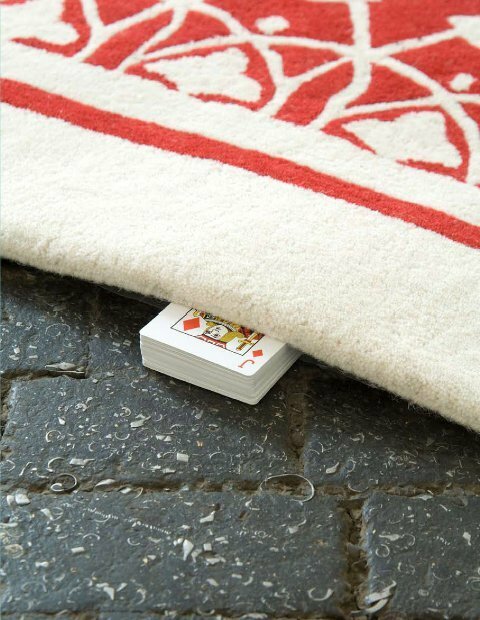 The first work is entitled "If I could see but a day if it (Multiverse)' and consists of a hand tufted Persian rug measuring 3m x 2m made to reveal the pattern one would usually expect to find on the back side of a playing card rendered in red and white. On which sits a small wooden box containing one standard plain pack of Parallel cards, a pencil and a small pile of postcards reading, Please send your games to: adressed to a PO BOX in London. Suggesting to the spectator/participant that their role in the work is to develop new games using the newly invented double faced pack of cards and to forward them to be compiled into a game book some time in the future.